These Mini Sausage, Spinach and Jarlsberg Cheese Frittatas are a fun change-of-pace breakfast recipe or on-the-go snack idea packed full of protein! Hello! Can I interest you in a cheesy breakfast? More specifically, Mini Sausage, Spinach and Jarlsberg Cheese Frittatas? Easter is this month and I am beyond excited because I love all things SPRING! Along with spring comes Easter brunch, lighter food, and lots and lots of sunshine. The sun is already making an appearance more often here in Rochester and it just puts a smile on my face. I have been cooking up some delicious brunch recipes with Jarlsberg cheese lately and am excited to share my Mini Sausage, Spinach and Cheese Frittatas with you today. 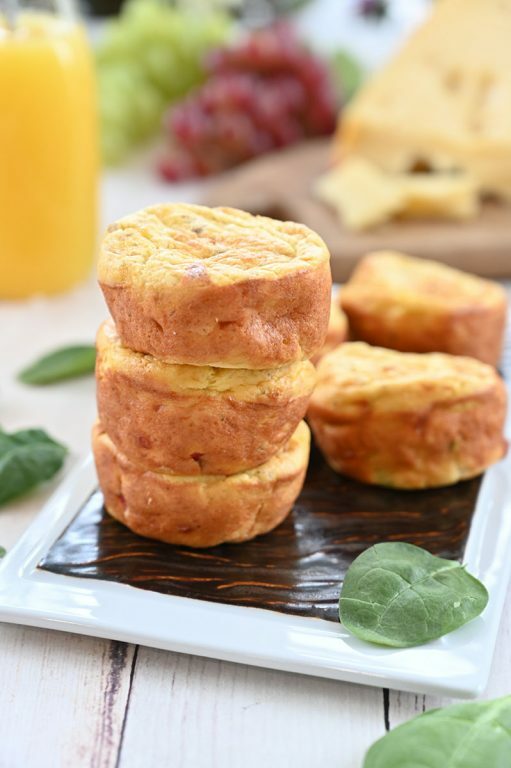 Mini frittatas are a great way to make breakfast for a crowd and a make ahead, protein rich meal you can keep for days and days. I love just being able to grab one and go when I am in a rush to be out the door in the morning with the baby. I am less likely to grab a sugary snack when I have these frittatas hanging out in the fridge! I used Jarlsberg cheese in this recipe as it is my favorite and the perfect cheese for melting into an egg dish. I enjoy their delicious cheese with crackers on a regular basis, but sometimes I like to make effective use of how well Jarlsberg cheese melts and turn it into an amazing brunch recipe. Anytime I make a recipe for my family, and especially when I am serving my food to guests, I always try to use the best high-quality cheese. I also use their cheese in my Toasted Almond Cheese Dip. Anyone who cooks a lot knows that it really makes a difference in taste and texture of your dishes! 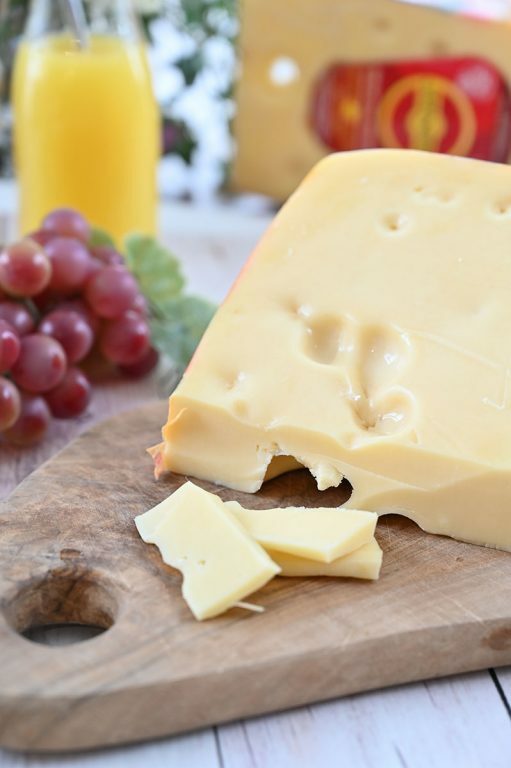 Jarlsberg cheese is the perfect breakfast cheese. These Mini Sausage, Spinach and Jarlsberg Cheese Frittatas stays moist and melty for so long thanks to the Jarlsberg cheese I used and it’s perfect to have out on the table for your Easter brunch this year. When a recipe can serve as breakfast, lunch, dinner, OR brunch (or all four) you know you have hit the jackpot. 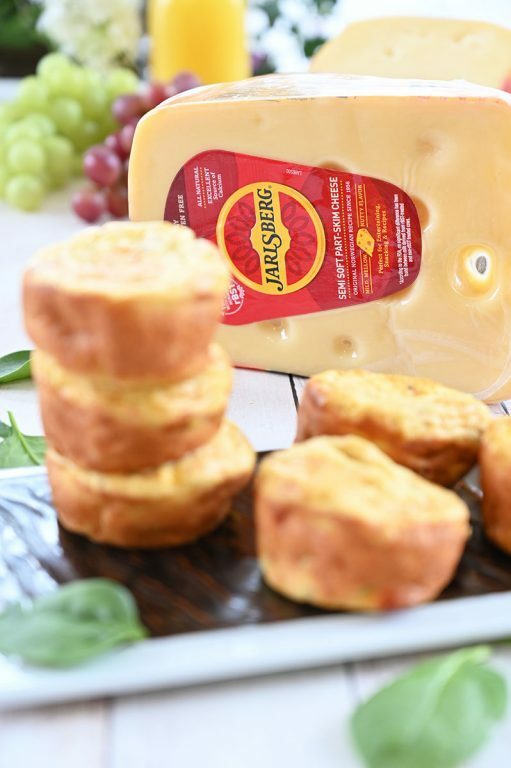 What makes Jarlsberg cheese special is that is has been one of America’s favorite specialty cheese brands for over 60 years. I remember having this cheese at holidays while I was growing up. Fun fact: Jarlsberg is the ONLY cheese my father-in-law will eat! There is really no excuse for someone who hates cheese like he does, but he will never pass up Jarlsberg cheese. Crazy, right? Jarlsberg cheese is a premium brand still made the same all these years later with the same secret. They use a Norwegian recipe developed way back in 1956: the combination of traditional cheese-making and modern technology is what gives their cheese that unique flavor. It’s hard not to appreciate it as so many do. The majority of the country’s products come from these large farms. However, Norway has an average of 26 animals on their dairy farms. Norway’s clean air combined with their smaller farm size means the animals roam in larger, purer pastures. There is your cheese lesson for the day! If you have never had the pleasure of tasting Jarlsberg cheese, I can help you out. It has a mild, buttery, nutty taste with a very smooth and silky texture. Their cheese is known for it’s distinctive holes and it is a very versatile cheese to eat alone, add to your cheese board, on a grilled cheese, pizza, or incorporate into any recipe involving cheese. I have found over time that it pairs great with sweet and tart ingredients such as sweet jams or tart fruits. I love the combination of the meat, spinach, and cheese in these mini frittatas. It is an absolutel flavor bomb. Frittatas are my go-to brunch recipe since they don’t require a crust to be made and can be whipped up in no time at all. I make these frittatas and my Cheesy Potato Sausage Breakfast Casserole frequently. If you are hosting a holiday breakfast or brunch this year, you can have all of the ingredients prepped ahead of time when your guests arrive, throw this together while they are there, bake them up in the oven, and have them nice and fresh. You can also make them ahead of time and just reheat them before serving. They are so versatile and that is what I love about this easy breakfast/brunch idea. You can eat them at room temperature or cold if that floats your boat. You won’t get that melty cheese effect, but melty cheese isn’t everything, right? Wait – yes it is! Cheese is life. 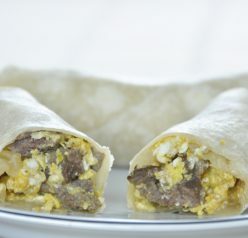 Serve them with my Baked Sausage, Spinach and Egg Breakfast Taquitos at your next brunch. They are the perfect pair! If you need another great brunch egg recipe, definitely try my buttermilk biscuit and egg breakfast cobbler. I also have to tell you about a great giveaway coming at ya! 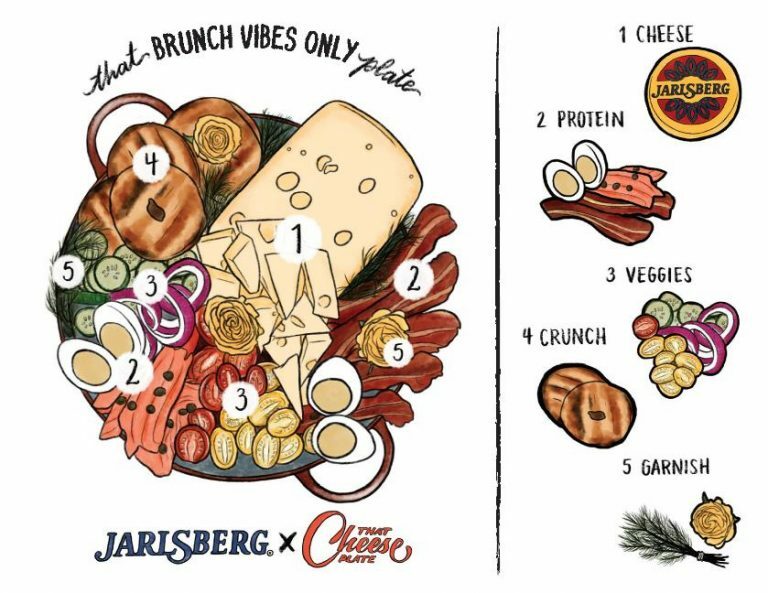 Jarlsberg Cheese Continues Its Year-Long “Cheese by Numbers” Giveaway Series that starts on April 5th – the “That Brunch Vibe Only Plate” Easter Basket. The series began on Valentine’s Day featuring cheese plates made in collaboration with Marissa Mullen, the founder of “That Cheese Plate”. She makes amazing cheese plates, guys! The next giveaway contest will be held this month for Easter with “That Brunch Vibes Only Plate” gift basket. Submission for the contest begins on Friday, April 5th and ends on Thursday, April 18th. “That Brunch Vibes Only Plate” will feature Jarlsberg®, nova lox, capers, mini-bagels, cherry tomatoes, and garnished with dill and yellow flowers, perfect for Easter brunch with friends & family! You can read more about the contest on Jarlsberg’s Facebook page, www.facebook.com/JarlsbergUSA/ or www.Jarlsberg.com. 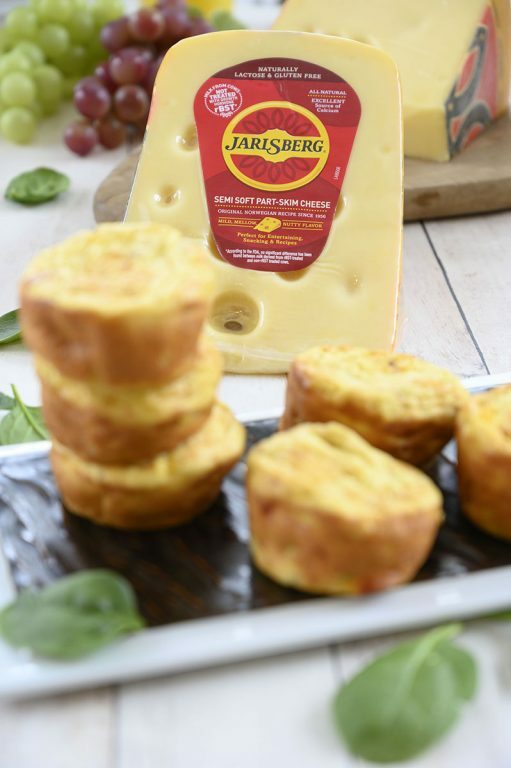 Giveaways will be announced throughout the year on the official Facebook page; cheese lovers across the US can enter by commenting on the Facebook giveaway post and tagging two people or by using the entry form on Jarlsberg’s website. 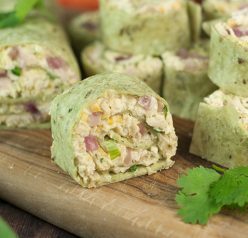 These Mini Sausage, Spinach and Cheese Frittatas are a fun change-of-pace breakfast recipe or on-the-go snack idea packed full of protein! In a large skillet, brown sausage over medium-high heat until no longer pink. Remove sausage to paper towel lined plate to absorb extra grease; leave grease in pan (add a bit of olive oil if no grease remains). Cook onion and spinach in pan until soft. Season with salt and pepper, to taste. In a medium mixing bowl, beat eggs and cream together until combined. Stir in sausage and onion/spinach mixture. Add in shredded cheese. Season with salt and pepper, to taste. Butter or grease a 12 cup muffin tin. Spoon about ¼ cup of mixture into each muffin cup. 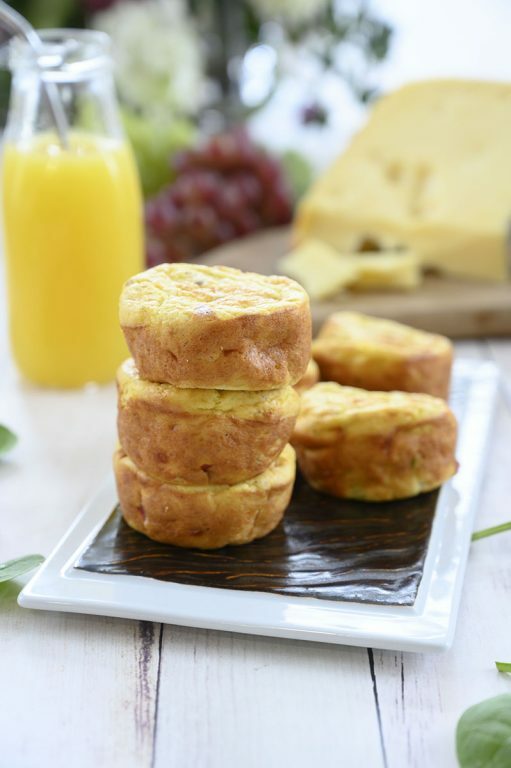 Cut each slice of swiss cheese in half and place one square of cheese on top of each filled muffin cup. Bake in preheated oven until cheese is bubbly and frittatas are set in the middle and lightly browned, about 20-25 minutes. Remove frittatas from oven and allow to cool for about 5 minutes. Remove from muffin tins and serve warm. Enjoy! Love frittatas! You can do so many great things with them — so flexible. This looks like a terrific recipe — thanks! 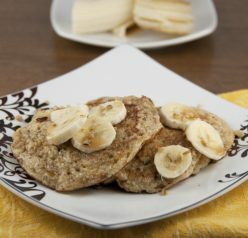 Mmmmmm….these are perfect for a delicious, easy breakfast!! I am a huge fan of Jarlsberg!! These are perfect for those mornings when you are on the go. I love quick and easy breakfasts! These are going on next Monday’s schedule! These are like the perfect bite! My kids really loved these! Can’t wait to make it again!